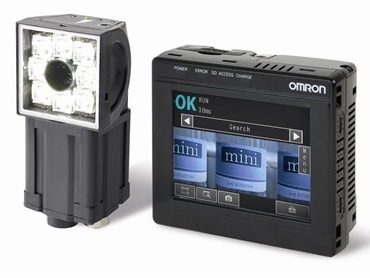 Omron Electronics introduces a new line of compact vision sensors incorporating full-blown image processing capabilities in a palm-size footprint. Low cost inspections are traditionally carried out using smart cameras or photoelectric sensors that have limited functionality and performance. Conversely, higher grade vision sensors demand extensive configurations as well as the know-how for making good use of technology. Type FQ Series vision sensors launched recently by Omron address these problems specifically, and are designed to simultaneously meet inspection reliability, ease of use and cost performance requirements. The new vision sensors incorporate Omron’s image processing technologies used in higher models, allowing reliable inspections for metal parts or shiny materials to be easily achieved without being affected by the installed environment. Type FQ Series vision sensors integrate camera, lighting and core processor, eliminating special know-how or complicated configuration work for selecting optimum combination of peripheral devices. Type FQ Series vision sensors also address applications in nine languages including German, Chinese, English and Japanese.